The NOPD has obtained an arrest warrant for Donnell Martin, 33, in connection with a domestic aggravated burglary incident that occurred on Oct. 17, 2018 in the 2800 block of Dryades Street. Through investigation, detectives learned that Martin reportedly arrived at the victim’s home and began to bang on the apartment door. When the victim opened the door, Martin allegedly forced his way inside and began to attack the victim. Martin then allegedly took the victim’s wallet and car keys before fleeing the location. When located, Martin will be arrested for aggravated burglary with battery committed. 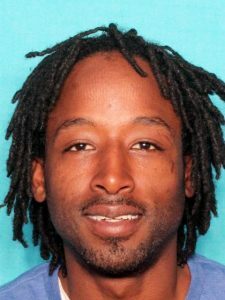 Anyone with information regarding the whereabouts of Donnell Martin is asked to contact NOPD Sixth District detectives at 504-658-6060 or call anonymously to CrimeStoppers at 504-822-1111 or toll free at 1-877-903-7867. The NOPD is also searching for a subject wanted in connection with the simple burglary of a vehicle, which occurred on October 3, 2018 at 3:38 a.m. in the 1000 block of State Street. The victim’s vehicle was burglarized while parked at the location. The incident was captured on video surveillance cameras in the area and can be seen here. Anyone with information on this incident or the identity of the wanted individuals is asked to contact Detective Sa’Brina James or any Second District detective at 504-658-6020 or call Crimestoppers anonymously at 504-822-1111 and toll-free at 1-877-903-7867.